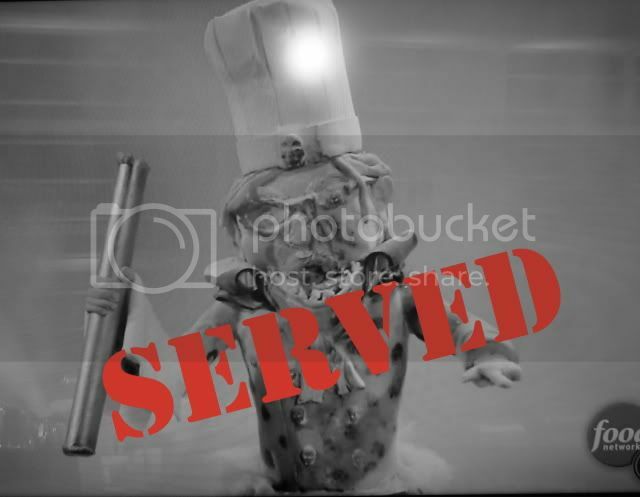 SERVED: I'm a Food Network junkie and have a fascination with watching any and all episodes of Food Network Challenge where the challenges are typically to make awesome themed cakes. Last night's episode was Extreme Villain Cakes where each artist would have to invent their own villain, create a cake, and then add an extreme element. Vinny's cake was my immediate favorite: he made his wife, also his baking partner, the villain and she was going to blow fire out of her mouth. Definitely extreme. The cake came out amazing and I think he was a clear favorite for the win... until they had to move the cake to the judging table. As Vinny and his team moved the cake onto the table, his [cake] wife's head fell off. Not good. They were given 15 minutes given to repair the cake and while Vinny and his wife found a work-around to get the head back out, it definitely threw off the fire mechanism. As they triggered their extreme fire, things didn't go as planned and instead the cake lit itself on fire! AWESOME! The moment of SERVING came when someone ran up and blew that baby with a fire extinguisher. Vinny was upset but shook it off cause he's a cool dude, but man did his cake get SERVED. But at least the servings in the cake are probably delicious.